This look is intended as an ode to my mind. My makeup looks do not seek to be perfection, I don't want structure, or the perfect lines. I don't want CGI makeup. I like it human, I like it raw and rough around the edges. I blend the life out of my eyeshadows to get that raw look. But in contradiction to that, I crave order and structure. That's where the liner plays its role. It isn't flawlessly straight, it's freehand and is as close as I'll ever get, but that's exactly what I want. I don't use sellotape, because in my mind, that's so flawless, it begins to look flawed. The way I work best is around structure and order. If my desk at work is a mess, I struggle to focus. If my dressing table at home is chaotic, my mind becomes chaotic. If the house isn't spotless, my mind becomes distract. So this look really displays a little bit of chaos, and a little bit of order. Fighting each other for superiority in my mind. So, it appears you've caught me monologuing. Classic villain mistake. Moving on, Safiyah kindly sent me a great selection of makeup goodies to try out, so I thought I'd do something a little interesting with them. 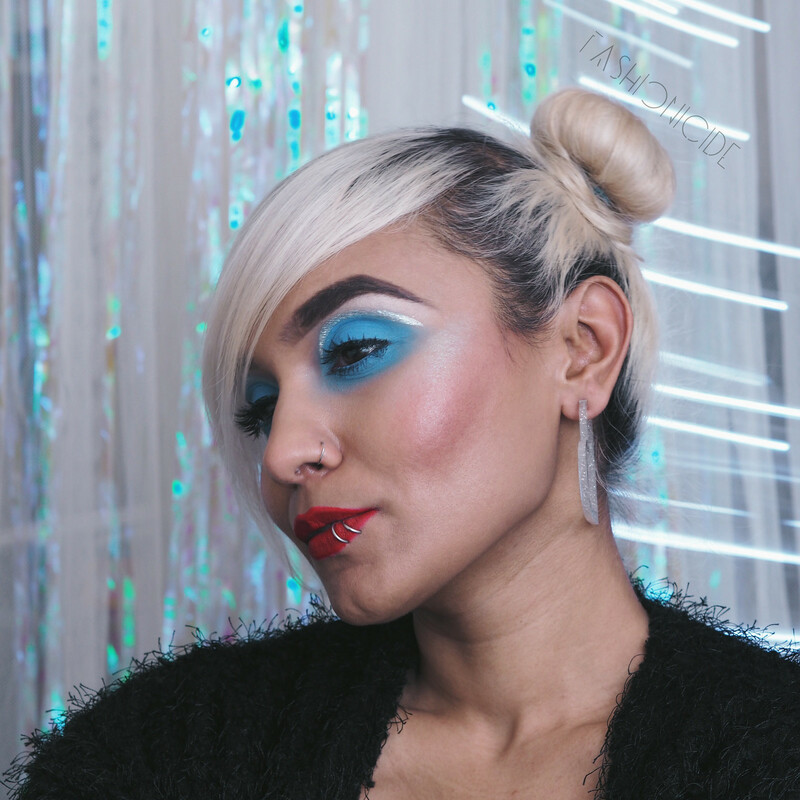 First up, there's the Illamasqua Sketch Stick in Free, which is a 'Cornflour Blue' shaded crayon that can be used anywhere. 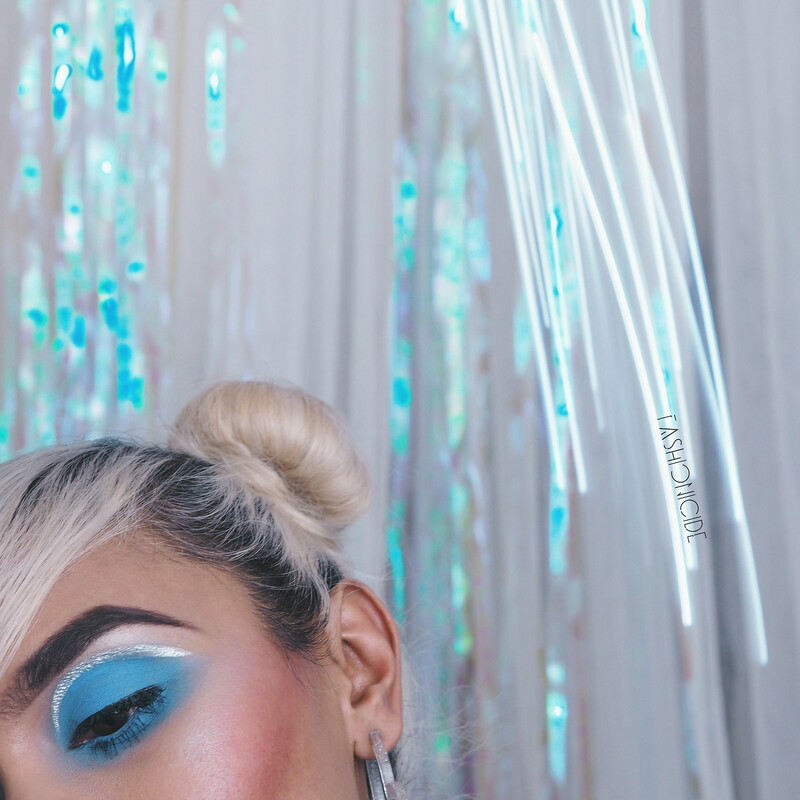 It's a really nice powdery blue, and I found it worked best as a base on my lids and lower lash line. 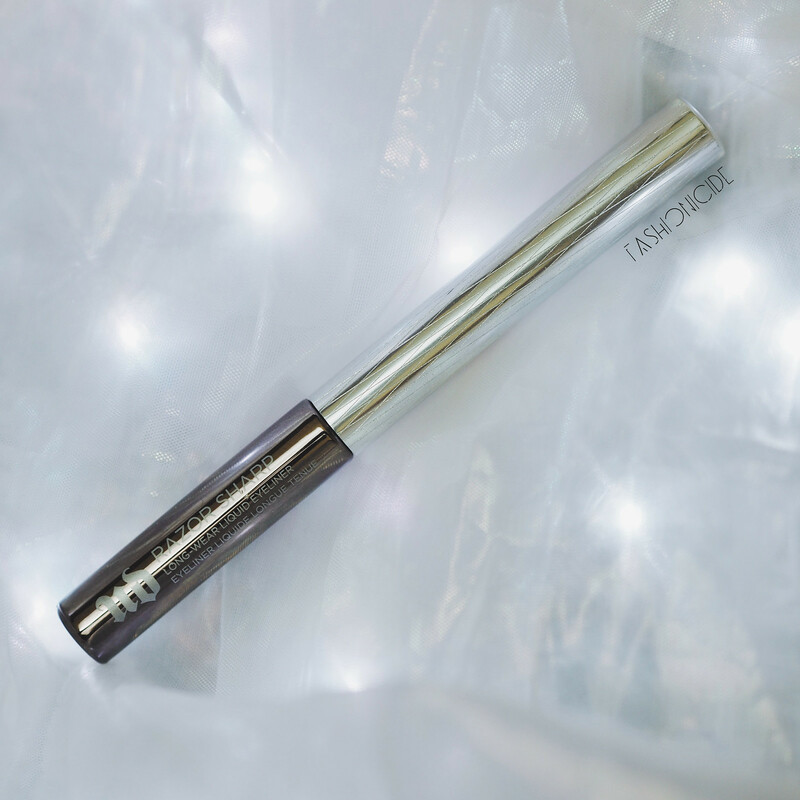 The formula is a little too creamy and prone to creasing for it to work well anywhere else - and yes, that's with or without a primer. In order to set 'Free' and iron out those creases, I needed to use a filter. Lime Crime's 'Filter', to be precise. The colour is remarkably similar to Free, and by applying it gently over the top it not only sorted out the creasing, it also made that colour POP! Of course, the next step was to blend dat sh*t out (chaos) and move in with the liner. I thickly lined my crease (structure) with another gem Saf kindly sent - Urban Decay's Razor Sharp Liquid Liner in 'Cuff'. My first thought on this was the brush tip, it is fine. So getting those precision lines isn't gonna be an issue. 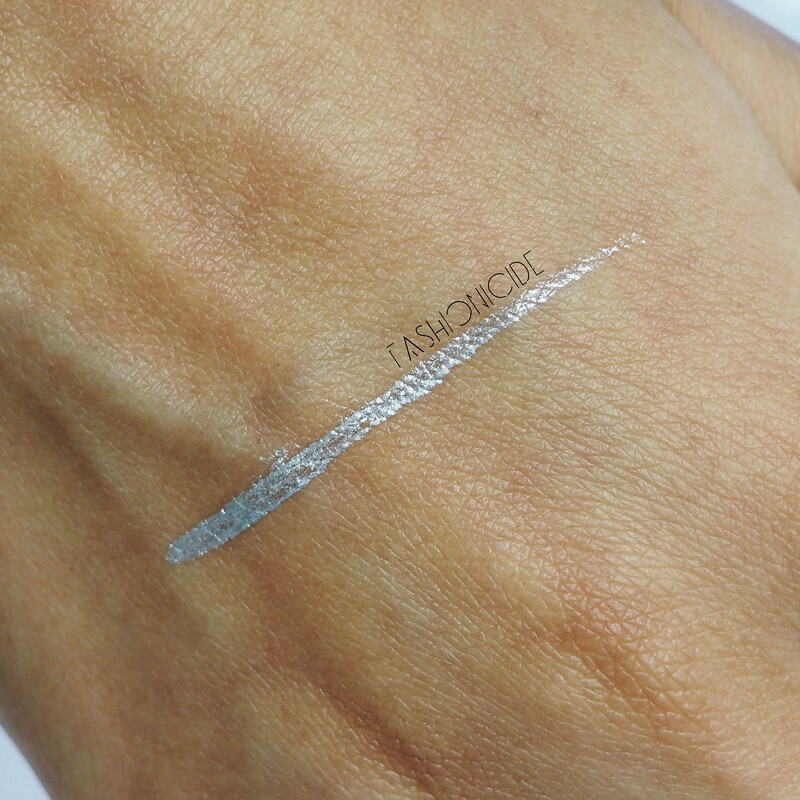 The finish is unlike any other liners I've ever had the pleasure of using - the closest I can think of is Lime Crime's 'Reason', which is also silver, but that finish is more metallic, where as Cuff is chrome-like, incredibly smooth and shiny - oh, and it stays shiny throughout the day. LOVE. And there it is, the perfect mixture of structure and chaos! Thank you to Safiyah for the goodies she sent my way, and for the chance to guest post on her fabulous blog! You can follow me over at Fashionicide, or check out my Instagram, where I've been embarking on a photographic journey through the dark, winter months.